As a parent, helping your child reach his or her fullest potential - and to grow up happy! - is perhaps the most challenging and difficult task (job?) you would ever have. And yet in today's world with ever geater demands of time due to technology and globalisation, often both parents struggle with full time careers while still bringing up a family. Now, throw in the extra component of nurturing young sports talent, even if real as opposed to imagined or hoped for as is often the case (! ), it is a miracle indeed if it does not end up a complete mess! In chess (and it must be the same for other sports), the game's administrators, tournament organisers, and especially the professional coaches clearly further complicate the mix, and yet where it comes to recognising which parents are failing their little "talents" in realising their potential, there seems to be an immediate consensus! 1. He or she is still their child, their responsibility - we can only play our role in relation to the development of the game no matter what our agenda/role might be (national promotion, child enrichment, successful international participation, etc.). 2. For every champion, there have been (and will always be!) literally thousands who started the same journey and fell by the wayside for whatever reason - we only see the few at the top of a very large pyramid and so can only guess at the many tragic stories (the sacrifices, bad luck, etc.) of those many who did not make it - although sometimes we get to learn about it because they almost did! 3. And if you have a child, really how good a job are you doing with your own young superstar? My advice: Chess is not life. Just let your child grow up happy! ChessASIA aims to provide comprehensive coverage of major chess events in the Asia-Pacific, and in doing so, to document the exploits and achievements of the talent emerging from the region. Where possible we seek to establish event marketing partnerships with organisers to offer our media services on site during tournaments - including helping with daily press releases and generating daily bulletins. 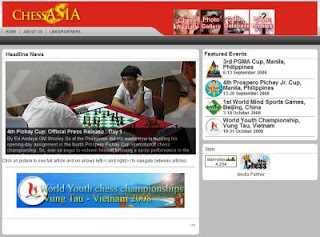 In short, ChessASIA desires to facilitate promotion of national and international events held in Asia both online and through the use of other digital technologies where available and possible. Our content is available without charge to all official media organisations and tournament organisers, and through our international media partner Chessdom. A Malaysian Tragedy - A Comedy With Endless Acts? I first learnt last year from Mas Hafizulhelmi at MAIGOC (Macau Asia Indoor Games) that he had been given 18 months paid leave by his employer Petronas (the Malaysian National Oil Company) to pursue his dream of becoming Malaysia's first grandmaster. 1. Senior Trainers from the ASEAN Chess Academy would begin reviewing his games and in the meantime we would arrange for him to play in a number of tournaments to get games for much needed practice against top level competition. 2. After 3-4 months, we would review his performance, subject the games to detailed analysis and if necessary, do any required remedial work. Otherwise it would be back to competition. 3. The first objective would be to get him to the level of a strong IM (2460) and if achieved, then work towards the second objective which is a 2500 rating after which hopefully the third and final objective of making GMs norms (2600 rating performances) could happen. In short, a realistic step by step approach. But immediately on our return to KL this began to unravel. 1. Mas was immediately shipped for a month of training with the Australian Grandmaster Ian Roger thanks to sponsorship by Dato' Tan Chin Nam (at that point still MCF President) and so what was agreed by us in Macau was immediately brushed aside. In fact then MCF Honorary Secretary Abdul Hamid Majid (whom I understand is only qualified as an arbiter in chess) had taken personal charge of his program and was arranging his tournaments so he was then sent to play in the Commonwealth Championship. 2. After that, following the Singapore-Malaysia Match, Mas played in the Singapore Open, then at the Tarakan GM "A", in a tournament in Iran, and finally, together with more training from Rogers, at the Doberl Cup and Sydney Open in Australia, all with results consistent with his current 2380+ rating. 3. Having run out of tournaments, Hamid asked the organisers for a free entry and full conditions in the back to back Philippines and Subic International Opens (he actually told them that Mas was too poor to pay the entry fee) but after that embarassing request was refused he paid up and played anyway and with pretty much the same results. 4. Next I heard that Mas was playing in First Saturday Budapest followed by the Biel Open in Switzerland and that suddenly his results were much better and even if he had missed GM norms he might have finally made an IM norm and he would have gotten rating points (some 30-40 elo points). 5. Back at the Malaysian Open, Mas is again back at his 2380+ rating level despite his trainer Rogers in attendance, but all the buzz was about the special GM tournament being arranged for him after where he would hopefully make his first GM norm. (I am writing this after he failed mathematically just after the half way mark as Mas is sensitive to criticism and I don't want him to blame me!). I still wish Mas well but I have to break my silence with this article and also to say here that he has not yet demonstrated he is playing beyond 2400 level and that is far from the 2600 performance he needs to make GM norms. From the start we had advocated a step by step approach to get his level up (as far that is possible would of course depend on his talent, character, and work ethic and of course the tournaments arranged) but instead he is expected to immediately be playing at GM level! There are so many things wrong with how Malaysian chess is run and do blame the people responsible for it for easily two decades now but this is really a tragedy that should not be played out in public. Do you know why do I choose to illustrate this post - my first in genuine anger at what chess in Malaysia has come to as I thought I had stopped caring - with the http://www.gilachess.com/ logo? Because while the likes of Andrew Ooi do means well, it also has come to be representative of the celebration of mediocrity together with self delusion that is Malaysian chess today. In short, we deserve what we have as that is what we are, having chosen it!